Roll Off Dumpster Rental | USA Grading, Inc.
A roll off dumpster is a large (10, 20 or 30 yard) open-top waste container that is usually rented to a customer for the purpose of removing different types of debris (see below for different types). The dumpster is delivered and removed by a roll off truck. Roll off dumpsters can be loaded by throwing the debris over the edge, loading with a piece of machinery, or by opening the gate/door of the roll off dumpster and walking it in.  USA Grading provides roll off dumpster services for Residential and Commercial customers. Our staff can help you get a roll off dumpster for any of the above projects. Our rental solutions are easy and inexpensive. Call USA Grading and we will set up the delivery, drop off the roll off dumpster and pick it up when you are done with it. All you need to do is load it up and call us when it is full. Our staff can help you get a roll off dumpster for any of the above projects. Our rental solutions are easy and inexpensive. We provide dumpster rental services to Manatee, Sarasota, Lee and Collier Counties. Our staff can help you find the best roll off dumpster to fit your needs. Please view our pricing guide. There are several factors that help determine the cost of a roll off dumpster. Rental costs are affected by several factors. The following are some of the main factors that affect dumpster prices. The larger the container, the more volume (weight) of waste it can hold. Transporting and dumping a heavier and larger can is also more labor intensive and more expensive. Dumping fees often vary greatly from one county to another. There are several factors that determine how much different transfer facilities and landfills charge. Our rates are determined by calculating transportation costs and cost to dump debris. This cost is calculated by determining the distance from your job to the appropriate dumping facility. The farther away you are from a recycling center or dump, the more you will pay for transportation. Common types of material that are recyclable are concrete, vegetation, wood, cardboard, aluminum/steel and these items are usually priced out at a flat rate when they are source separated. Non-recyclable or mixed debris is charged at a higher rate and is usually taken to a facility that will separate the debris. The “good” material is sorted from the “bad” material and both are transported to the appropriate facilities from there. Some material (household garbage, etc.) is taken to a landfill or in some cases, an incinerator. This is material that has no value and is usually a little more expensive to dispose of.